'The New Pearl Harbor' was one of the first books which I read after beginning to be earnestly curious about 9/11.. I was suggested it by a great friend, and it is what set me on my way of understanding the questions, coincidences, and contradicting evidence surrounding 9/11. It is a great reference book to have after reading as it has 40+ pages of very detailed and exact references. it is a great reference book and a great introduction into 9/11 from a well respected theologian and author. both of the books by Griffin are an excelent start for anyone looking to understand why it is that millions of people around the world still are questioning 9/11 without going too far in depth on specific 'conspiracy theories'..
'The 9/11 Commission Report: Omissions And Distortions' was one of the latest books I have read. Griffin's latest book is a sort of continuation from his prior book examining the findings of the 9/11 commission. It again is very well referenced, and points out how the 9/11 commission was focused on analysing the official story and using testimony which fit their pre-determined story board, while ignoring valid evidence and testimony which directly conflicted with the commission's final report. 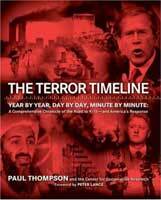 'The Terror Timeline' by Paul Thompson is basically a printed version of his massive online timeline at cooperativeresearch.org.. he is very well known in the 9/11 community because his massive timeline is second to none. it really has to be seen to appreciate the scale of his work.. i do not yet own this book, but i am very familiar with his work and appearences at independent investigation panels and can only imagine that this book is a great reference. 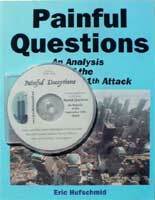 'Painful Questions' is focused almost completely on physical evidence from 9/11.. this book accompanies a DVD called 'Painful Deceptions'.. while i will avoid reviewing the DVD here, i will say that the book without the DVD and visa-versa doesnt show the full depth put into Hufschmid's work.. this book has a rather large section towards the end which discusses other conspiracies such as JFK's assasination, and mass media compliance to government possitions.. this book has more in the way of full color images than any other book and serves as a great reference and book for that reason alone.. i have found myself coming back to this book (and the video) many times throughout my research as they cover a large breadth of 9/11 physical evidence. '9-11 On Trial' is a recent release (March 2005 I beleive) which focuses solely on the collapse of WTC1, WTC2, and WTC7 on 9/11. this book is very simple, and is a single day read.. basically it takes the form of a mock trial examining all the facets surrounding the collapses of these 3 buildings on 9/11.. it uses news reports and interviews to form responses from mock witnesses to form what could be an example of how the WTC collapses could be examined on trial. this book would benefit alot by including photos in a future release.. while the book is very short and simple, it does a great job showing the arguements for controlled demolition on 9/11. I have not finished reading this book yet so I will limit my comments until I finish. First off, Karl Schwarz has come out recently as a major backer to the 9/11 truth movement both in his research and his efforts to show the overall picture of corruption surrounding 9/11, including the Bush administration.. while Karl Schwarz doesnt have the best writing abilities, he is a well spoken speaker and gets his points across very well. he is a lifelong conservative republican seeking to show other republicans and conservatives why they shouldn't support the bush administration.. this book covers also his research into the Bridas corporation and the oil pipleline through afghanistan. I would suggest reading his series of articles entitled 'Pop Goes the Bush Mythology Bubble' for some insight into his work and his opinions. Micheal Ruppert was a major player in the first wave of 9/11 research. his focus includes the wargames of 9/11, how 9/11 relates to the idea of peak oil, and his overall theory on how 9/11 was carried out and compartmentalized.. while Ruppert has stepped back from 9/11 in the last year, his work remains a large influence on 9/11 research. Although I have not finished his book, what I have read is definately intriguing and thought provoking in trying to understand 9/11 in a larger context.